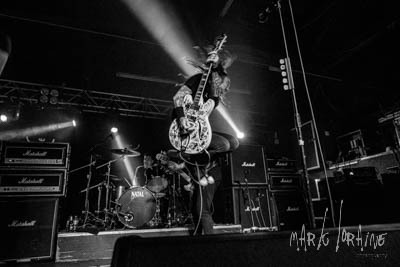 Apparently, tonight’s gig is billed as a warm up for The Wildhearts before they head off to Japan and Australia, let's hope they enjoy similar size crowds out there as they are doing here in The Plug in Sheffield. Just as a side note, it has been rumoured that this pretty decent venue is soon to close and become a golf superstore – what a damn shame if it's true, OK not a classic Sheffield venue along the lines of The Leadmill, but all the same a great live music outlet. Another One Bites The Dust (if you needed a musical reference).